How Much Should You Pay for Franchise Lead Generation? If someone asked you 20 years ago which newspaper they should advertise in for franchise leads, you would want to know several things. How big was the circulation of the newspaper? Was it a serious paper with articles on finance and business? Who were the readers? Now, you have many more options: print, online, press release, display ads, search, pay per click, business directories, and trade shows. How can you get more from my franchise lead budget with all these various options? How do I re-balance between them? What makes sense as a better balance? How do you decide where to advertise? The basic methodology remains the same as it was 20 years ago. And fortunately, much of the answers are far more transparent today than 20 years ago. 1. How much am I spending now, in a particular medium? 2. What are the general metrics for that medium in terms of readers & time spent? 3. Are there cheaper substitutes which have similar engagement metrics? If so, put more money into the cheaper but similar substitutes and see if you get more leads. Repeat every 6 months to a year. Here is a simple example, using data from 2012. 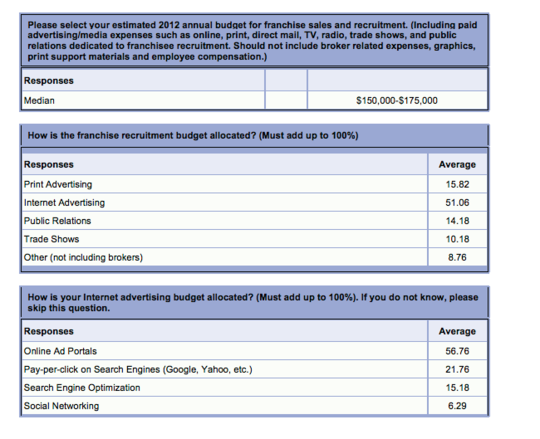 We know from the 2012 Franchise Update Survey that the median spend for lead generation is between $150 - $175k. On average, then people are spending between around $42,000 and $51,000 on advertising for leads using Franchise Portals. In essence, the format on the Franchise Portal is a display ad in a business directory with an application form to fill out for more details. 2. What are the Engagement Scores of the Franchise Portals? It is very easy to get some objective comparsions between the various Franchise Portals. I compared our site, franchise-info.ca to 4 webportals: franchise.com, franchisegator.com, franchisedirect.com & franchising.com, in 2012. First, you want to focus the rank in US. Second, you want to pick some measure of engagment, say time on the site. Or you might pick pageviews, as another measure of engagement. 3. Are there cheaper substitutes with similar engagement scores & that should produce the same number of leads for less? Suppose your budget shows that you have been paying $800/month per display ad for portal 1 and $600/month for portal 2. First, forget about the actual leads because we are interested in maximizing expected leads. Second, is portal 2 more engaging than portal 1? 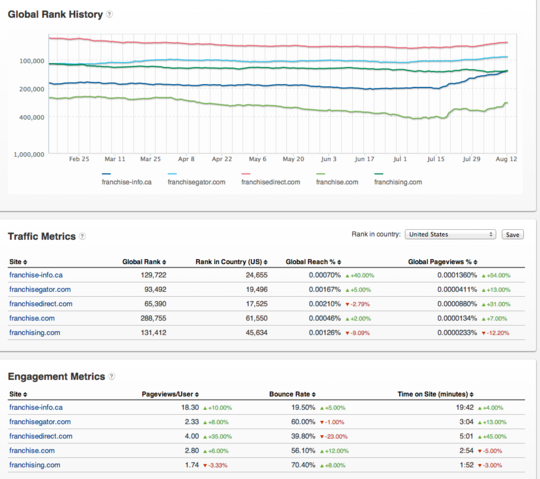 This calls for some judgment about how to balance relative rank against pageviews and time spent. Make your decision, record the reasons why, and then revisit it in 6 months. Do the numbers still make sense? Is there evidence that you made the right trade-off? Should you rebalance again? Keep at it and over time this rebalancing method will prove to produce better leads for less dollars. If you want to use LinkedIn to recruit franchise operators, ask us to send you the LinkedIn Sponsored Content Guide. We will sign you up for our LinkedIn Marketing Tips newsletter, too.